I. 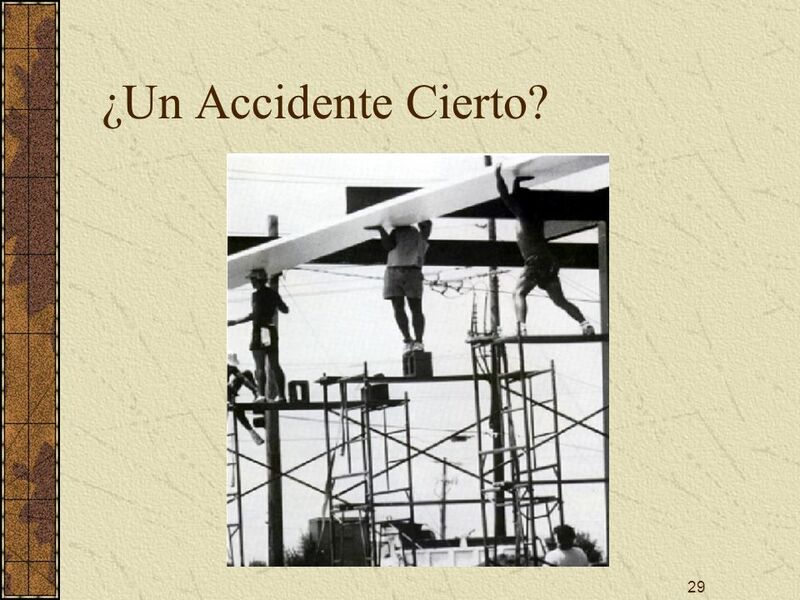 Introduction A. Scaffold related injuries and fatalities continue to occur throughout the construction industry. 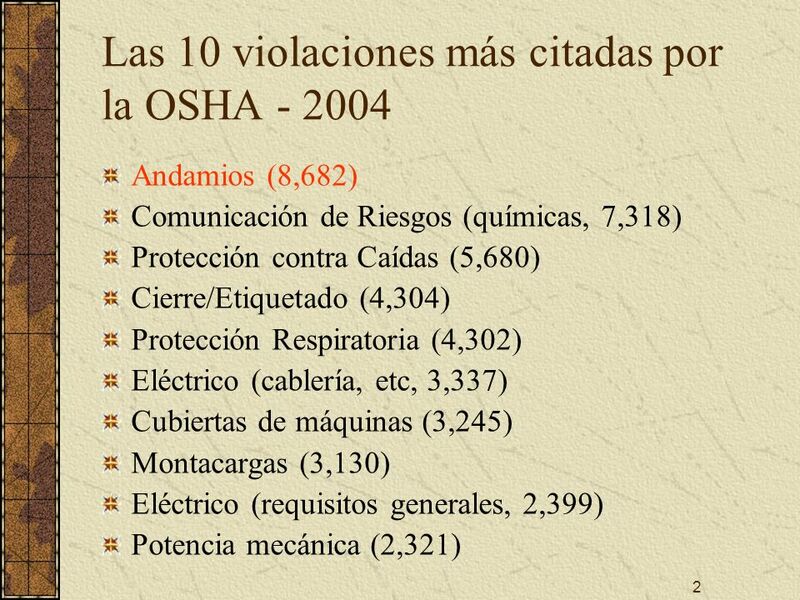 In an effort to reduce these statistics, OSHA revised Subpart L, Scaffolds on November 9, 1996. 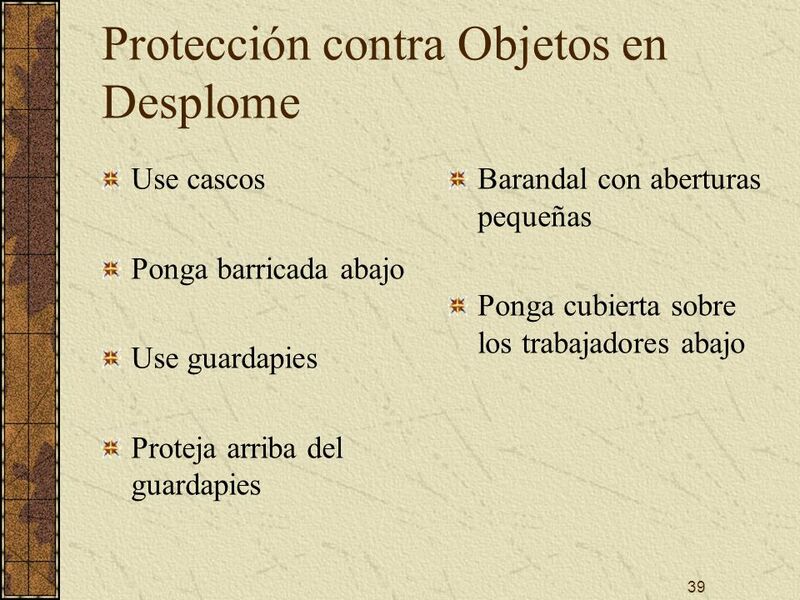 Andamios Sostenidos Andamios Suspendidos Acceso y uso Protección contra caídas Protección de objetos en desplome II. 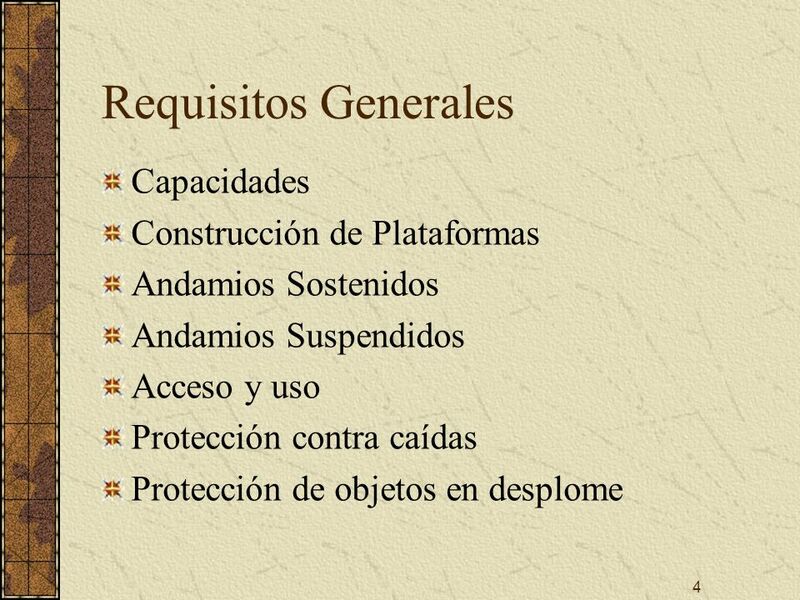 General Requirements A. 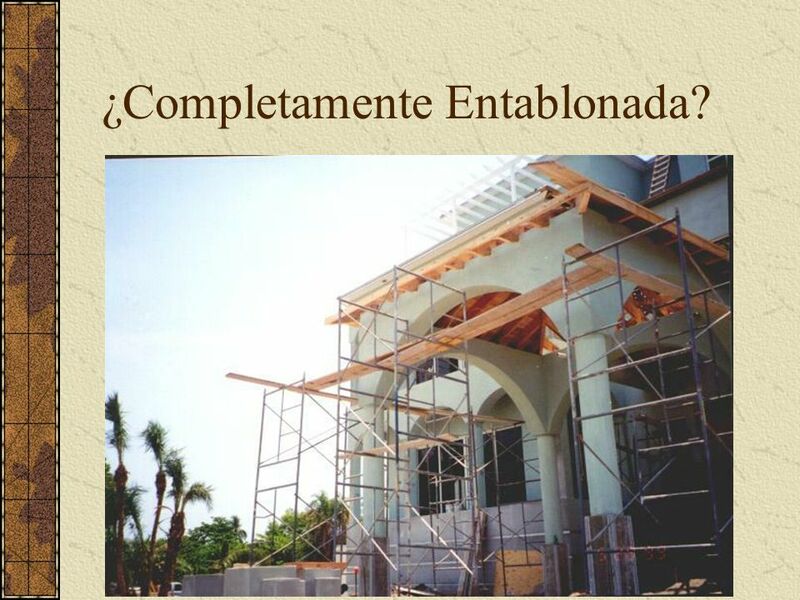 The general requirements for scaffolding are covered in CFR We will look at the requirements as they relate to: 1. 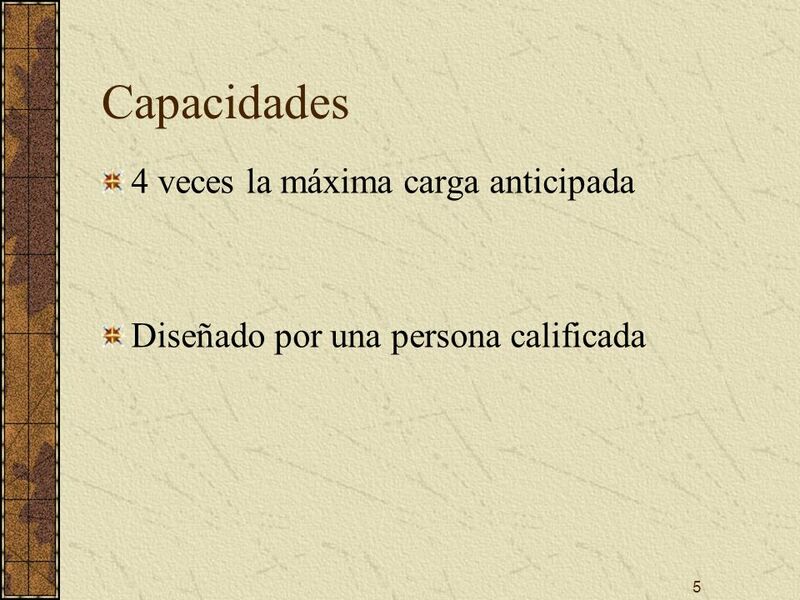 Capacities of scaffolds 2. Platform construction 3. Supported scaffolds 4. Suspension scaffolds 5. 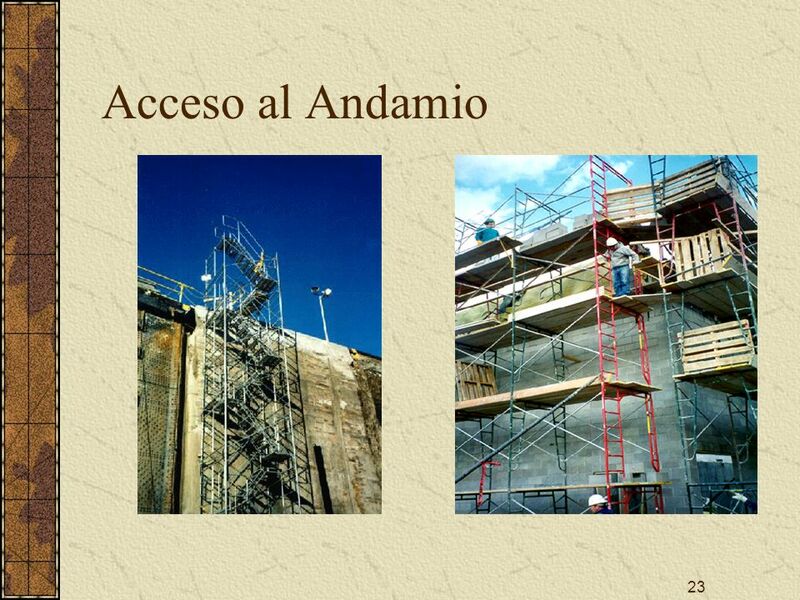 Access to and use of scaffolds 6. 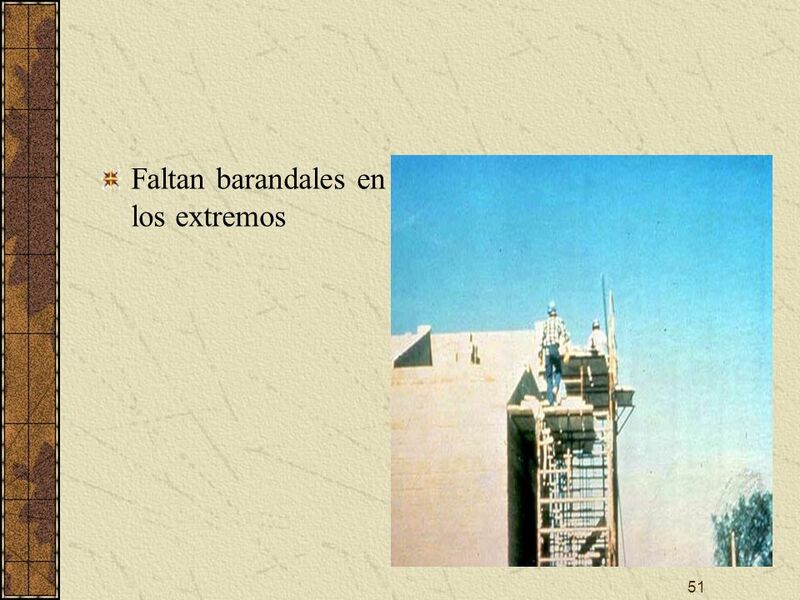 Fall protection 7. Falling object protection The first thing to consider is the capacities of various scaffolds. Diseñado por una persona calificada B. The following is a list of the various scaffold capacity restrictions: 1. Each scaffold and component must be capable of supporting its own weight and four times the intended load placed upon it. 2. The stall load (load at which the prime-mover of a power-operated hoist stalls or the power is disconnected) of any scaffold hoist must be three times its rated load. 3. 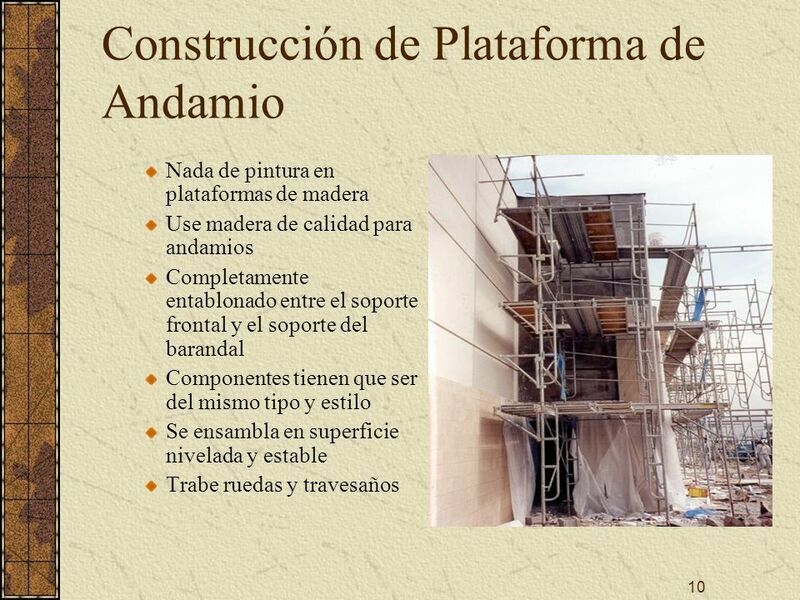 Scaffolds must be designed by a qualified person and must be constructed and loaded in accordance with that design. 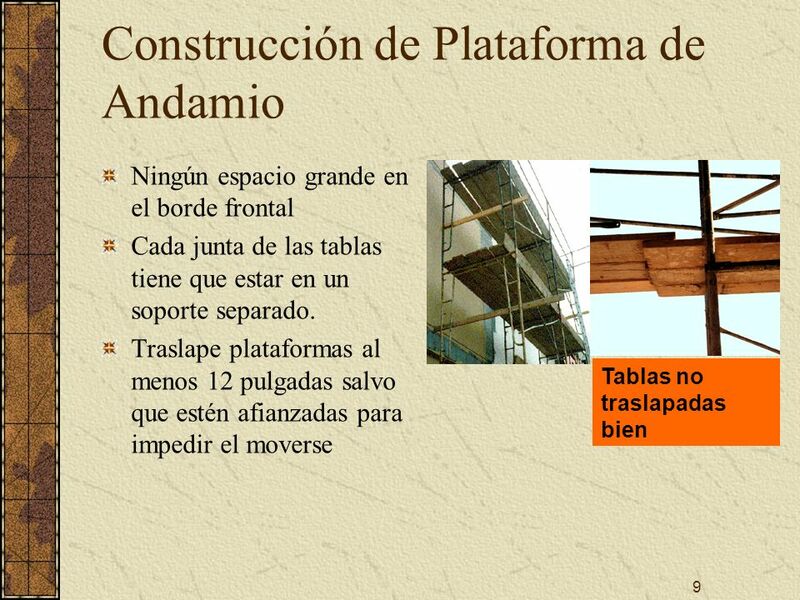 The next thing to consider is the construction of the platforms used on scaffolds. 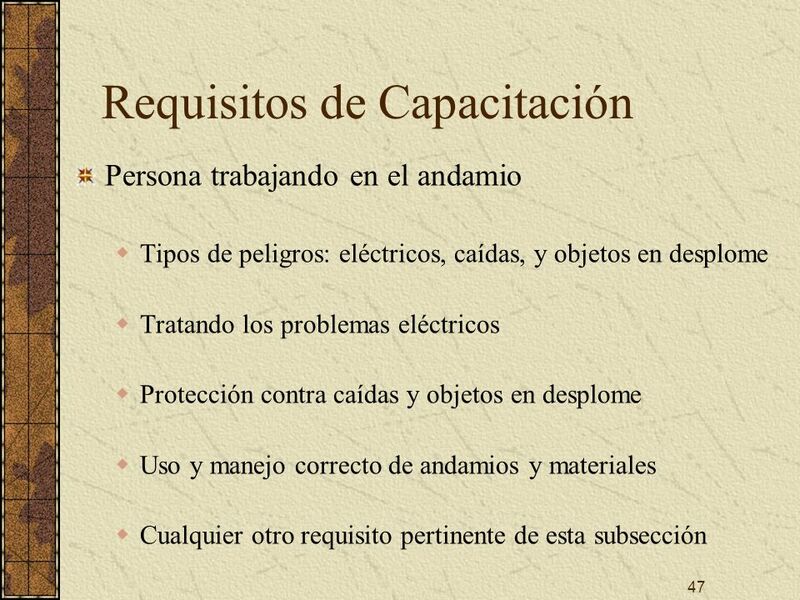 6 ¿Aguantaría esto 4 veces la carga? 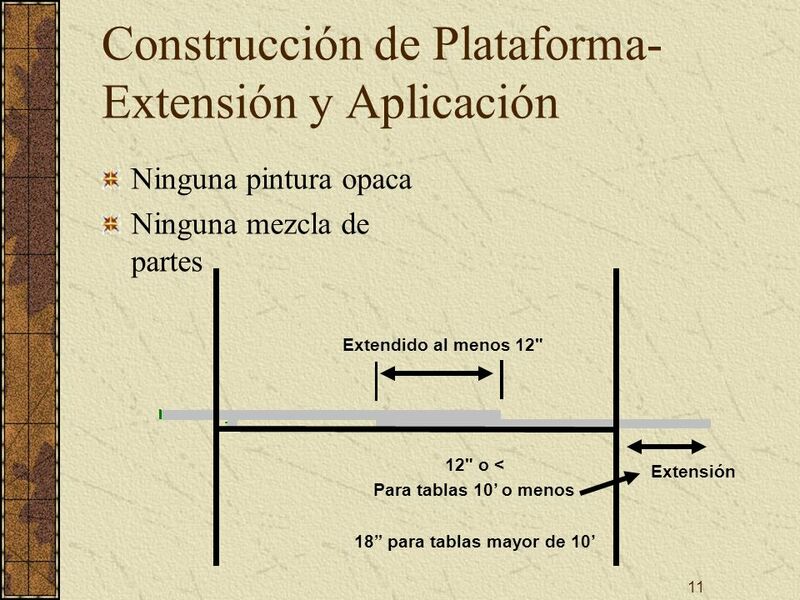 Completamente entablonada: No se aplica a plataformas usadas como pasarelas o al ensamblar o desmantelar Máximo 1 pulgada Al menos 18 pulgadas C. All scaffolds must be fully planked and decked as follows: Each platform unit must be no more than one inch from the adjacent unit or from the uprights in the scaffold. The upright rule may be waived if more space is required to fit around uprights with side brackets. This upright space may then be no greater than 9 ½ inches. 2. Each platform and walkway must be at least 18 inches wide. If the employer can show this is not feasible, then the platforms and walkways can be as wide as possible but must be protected by guardrails and/or personal fall arrest systems. 3. 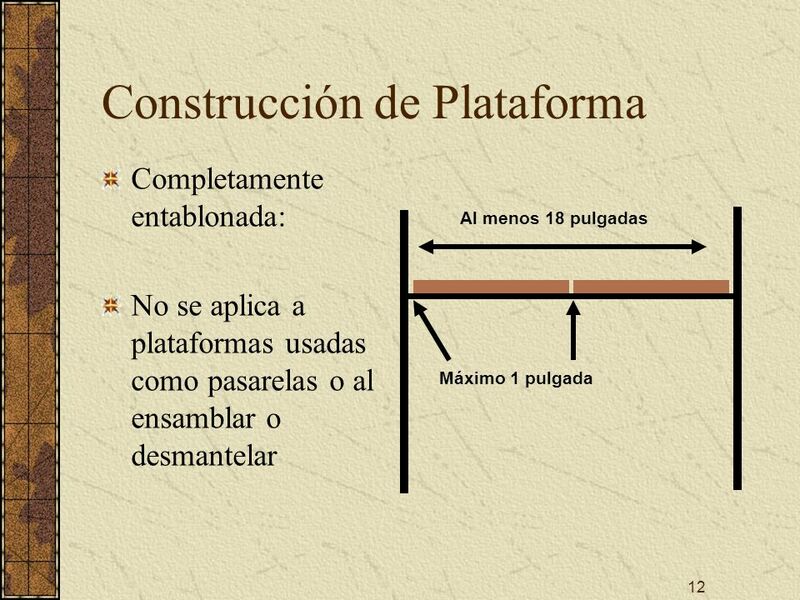 The dimensions are not applicable to platforms used as walkways or during erection or dismantling. 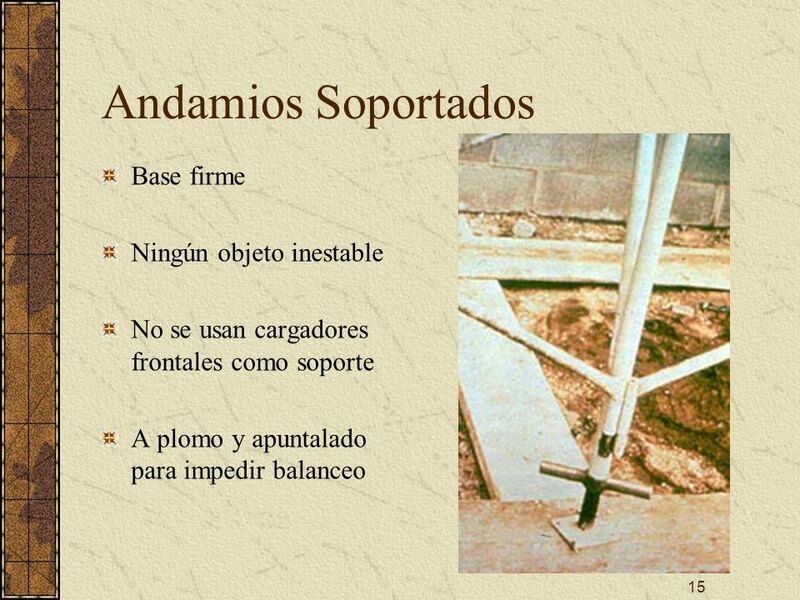 No se usan cargadores frontales como soporte A plomo y apuntalado para impedir balanceo H. Supported scaffolds must rest on base plates, mud sills or other firm foundation. 1. Don't use unstable objects for support or as platforms. 2. Don't use a front end loader or similar equipment for support unless they are specifically designed for this use. 3. All scaffolds must be plumb and braced to prevent swaying. 18 ¿Es Esto un Andamio? 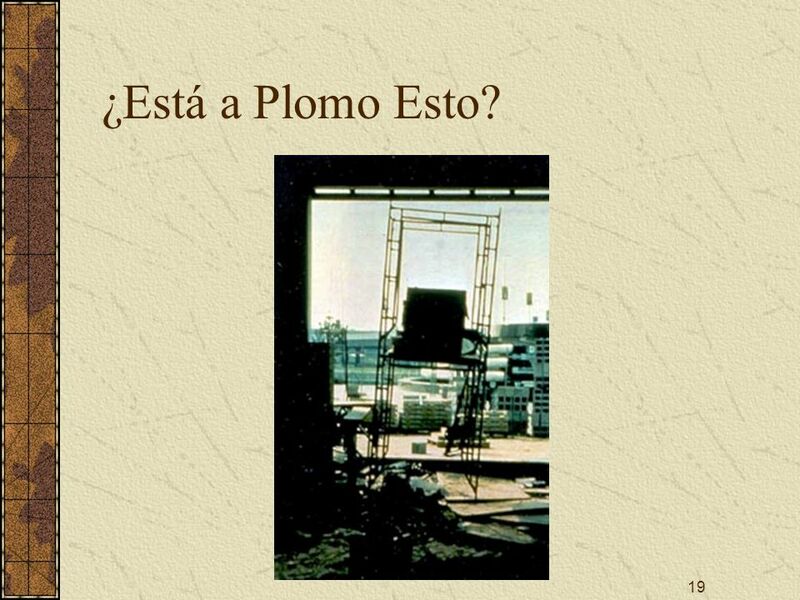 19 ¿Está a Plomo Esto? 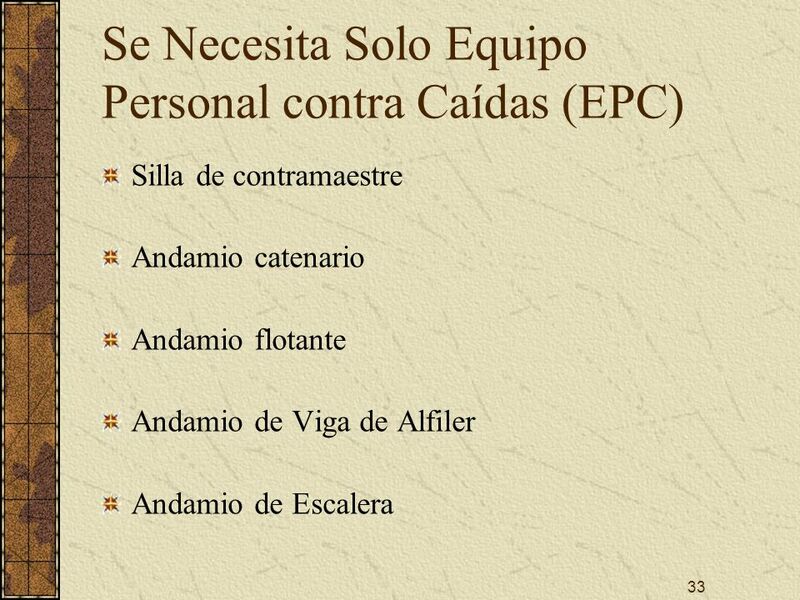 Inspeccionado por persona competente No se permite equipo y tornos impulsados a gasolina Engranajes y frenos tienen que estar cubiertos Cuerda de suspensión - 6X carga anticipada I. 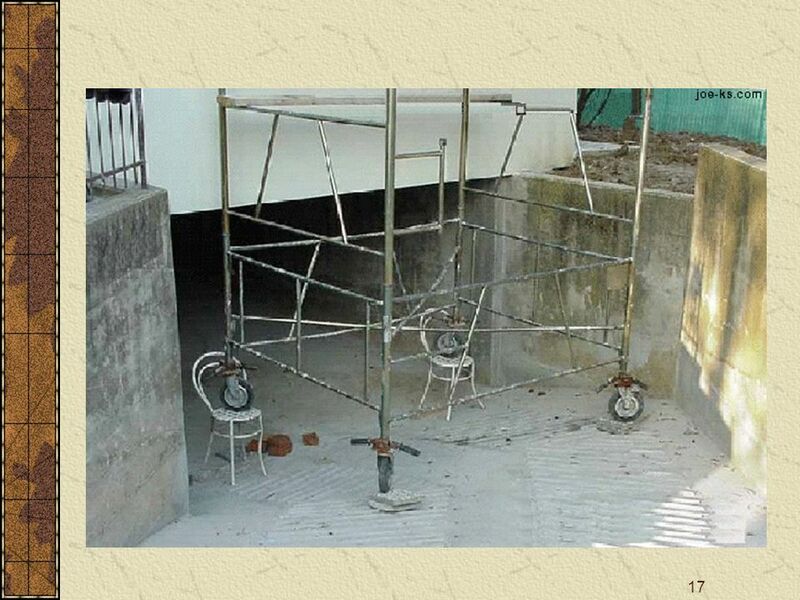 There are a number of guidelines to follow when using suspension scaffolds: 1. Using any type of repaired wire rope is prohibited. 2. All components of the scaffold must be inspected by a competent person prior to use. 3. 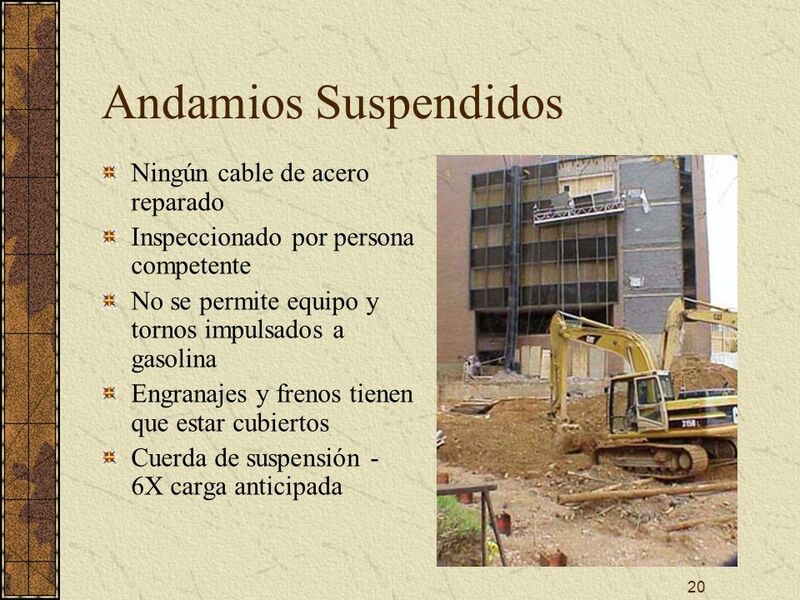 Gasoline powered equipment and hoists can not be used. Gears and brakes must be enclosed to protect workers. 5. Suspension ropes must be able to support at least six times the intended load placed on them. These are but a sampling of the requirements. The remainder can be found in (d). 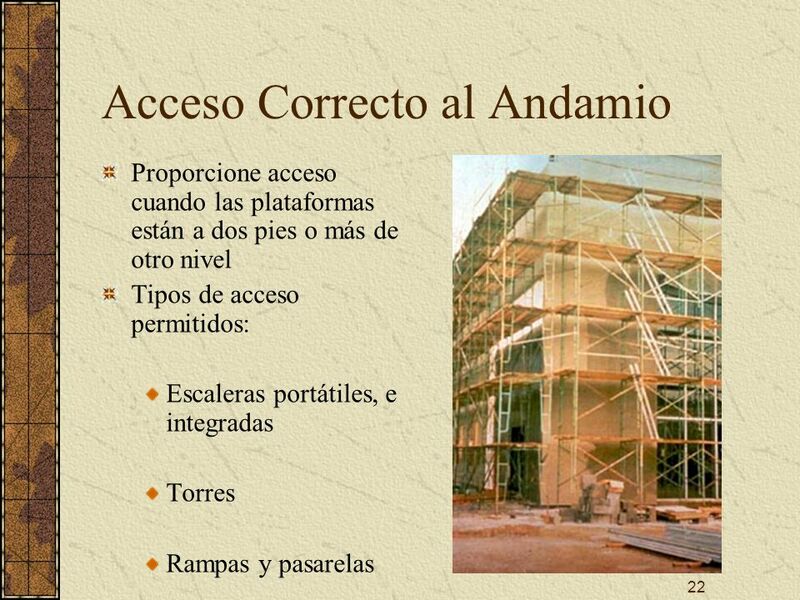 Proporcione acceso cuando las plataformas están a dos pies o más de otro nivel Tipos de acceso permitidos: Escaleras portátiles, e integradas Torres Rampas y pasarelas K. There are certain requirements that apply when using portable ladders to access scaffolds: 1. 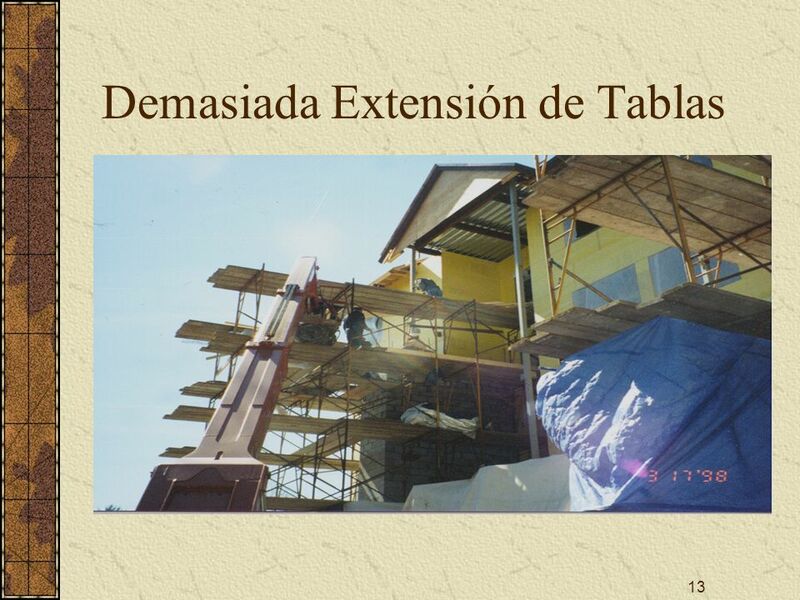 The bottom rung of the ladder must be 24 inches or less above the scaffolding support level. 2. If ladders are used on scaffolding that is more than 35 feet high, there must be rest platforms provided at 35 foot intervals. 3. Each rung on the ladder must be at least 11.5 inches long. 4. The rungs must be no greater than inches apart. The remainder of the requirements can be found in (e)(2). 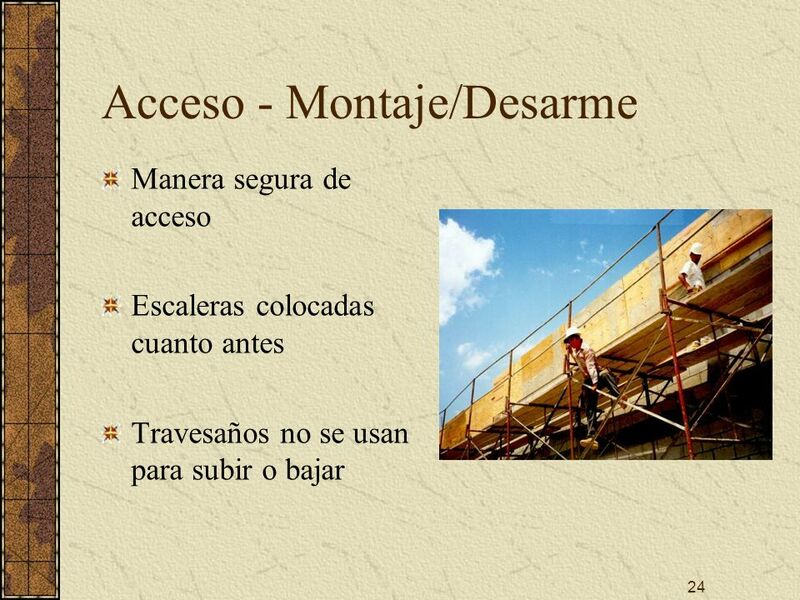 Manera segura de acceso Escaleras colocadas cuanto antes Travesaños no se usan para subir o bajar P. The following procedures must be followed when erecting or dismantling a scaffold: 1. A safe means of access for the workers performing the work will be determined by a competent person. 2. 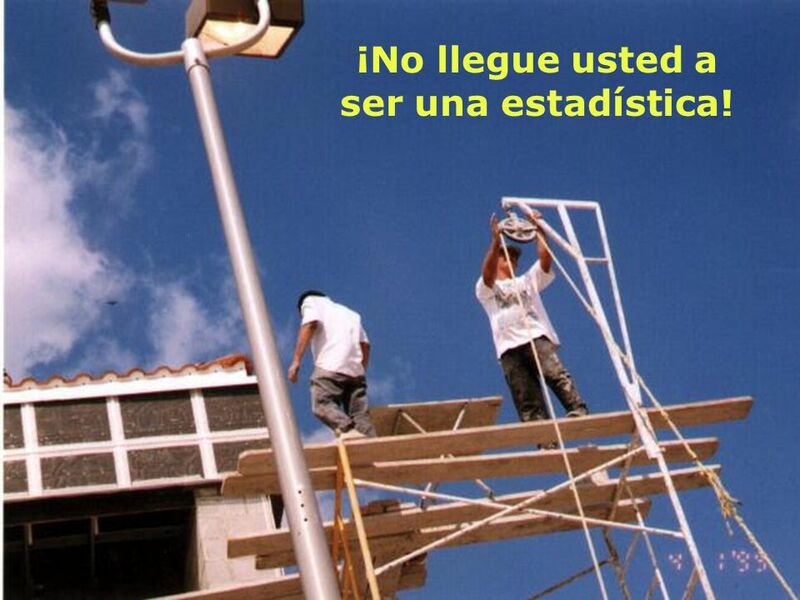 Ladders must be in place as soon as possible for use by the workers. 3. Crossbraces must not be used for access or egress. 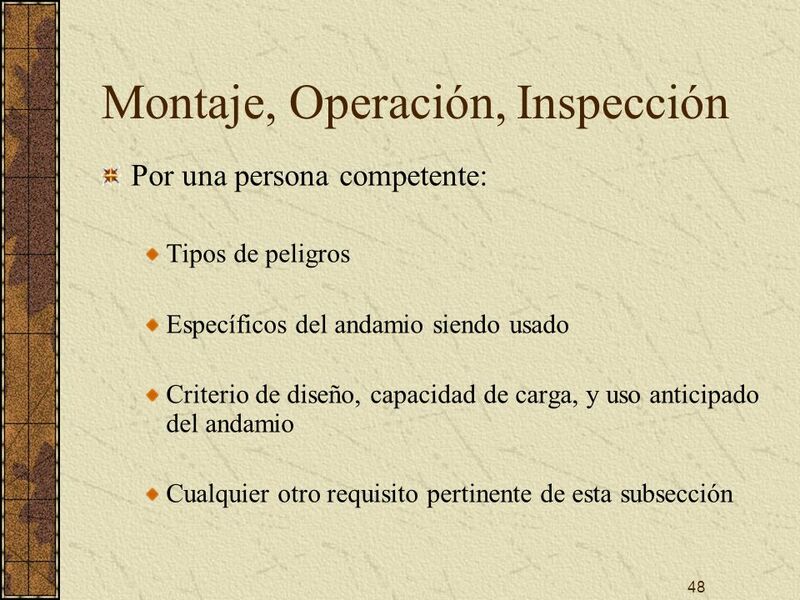 No sobrecargar No se deben usar andamios provisionales Inspeccionados por persona competente Remover partes dañadas Ningún movimiento horizontal con trabajadores en el andamio Persona competente supervisa montar, mover, desmantelar, o alterar Q. When using a scaffold, there are certain general guidelines which must be followed: 1. 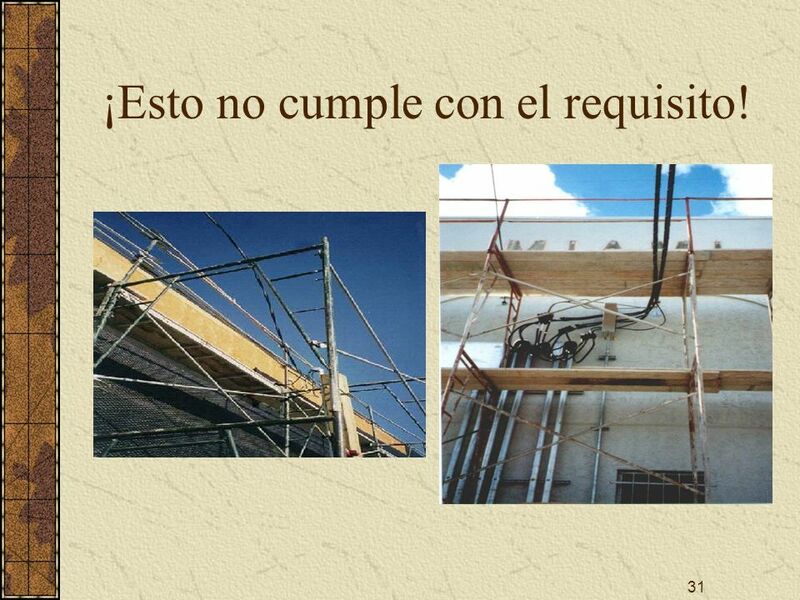 Scaffolds and their components must never be loaded in excess of their maximum intended loads or rated capacities. 2. Shore or lean-to scaffolds must never be used on a jobsite. 3. A competent person must inspect scaffolds and components before each workshift or after any occurrence which could adversely affect the structural integrity of the scaffold. 4. All damaged parts must be repaired or replaced. 5. 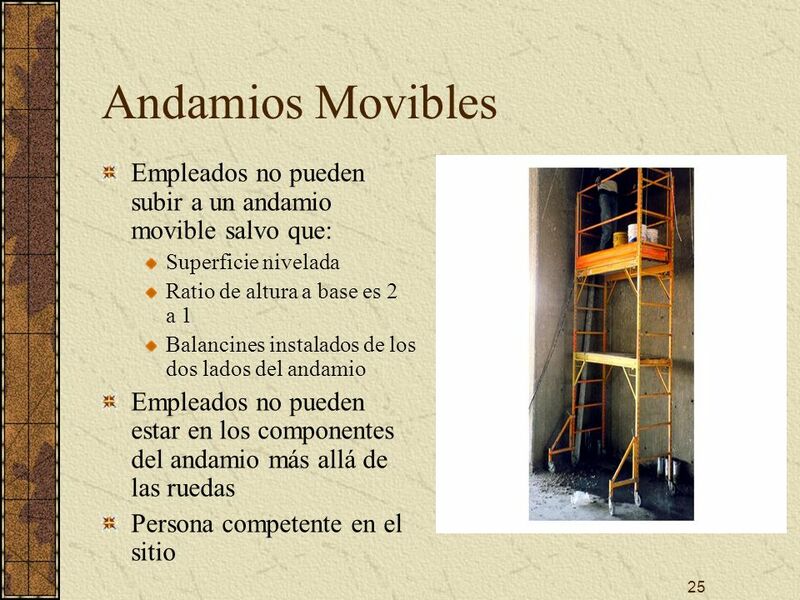 Never move a scaffold horizontally with workers on the scaffold unless it has been designed by a registered professional engineer for this purpose. 6. 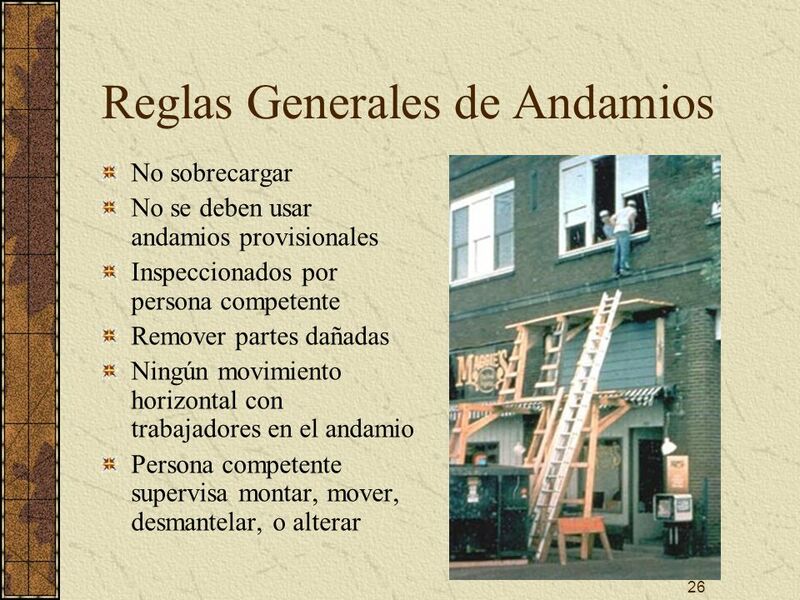 A competent person directs and supervises the erection, moving, dismantling or alteration of all scaffolds. 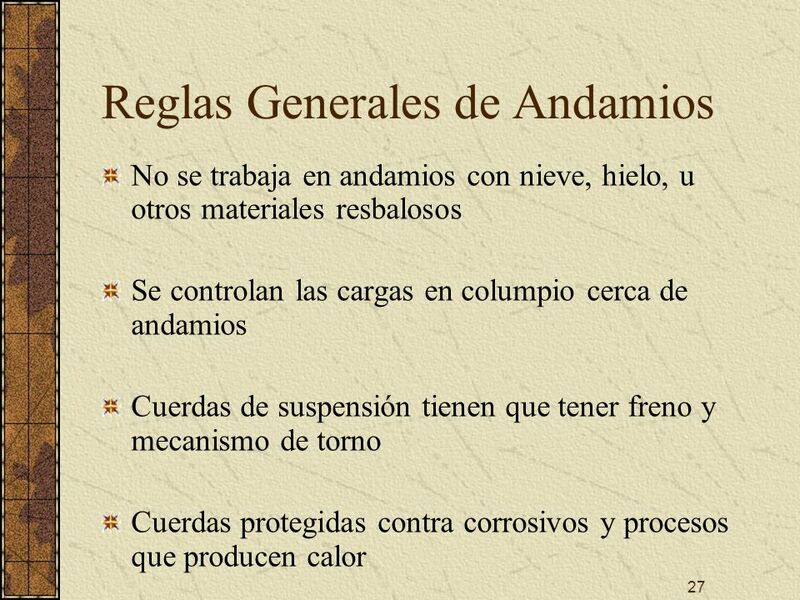 No se trabaja en andamios con nieve, hielo, u otros materiales resbalosos Se controlan las cargas en columpio cerca de andamios Cuerdas de suspensión tienen que tener freno y mecanismo de torno Cuerdas protegidas contra corrosivos y procesos que producen calor 7. Work may not be performed on scaffolds with snow, ice or other slippery materials present unless the workers are removing these hazards. 8. 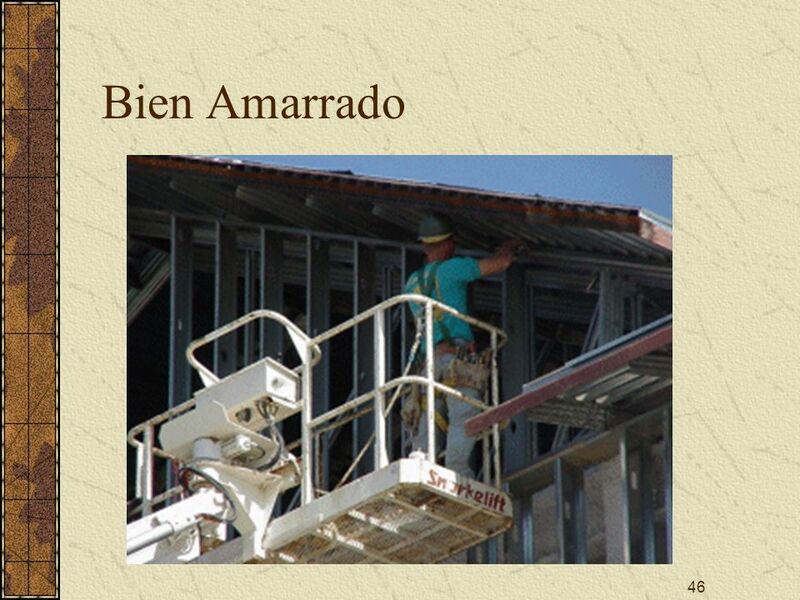 Use tag lines or equivalent measures to control swinging loads near scaffolds. 9. Suspension ropes on adjustable suspension scaffolds must have a diameter sufficient to allow brake and hoist mechanisms to function. 10. Suspension ropes must be shielded from heat producing processes and corrosives. 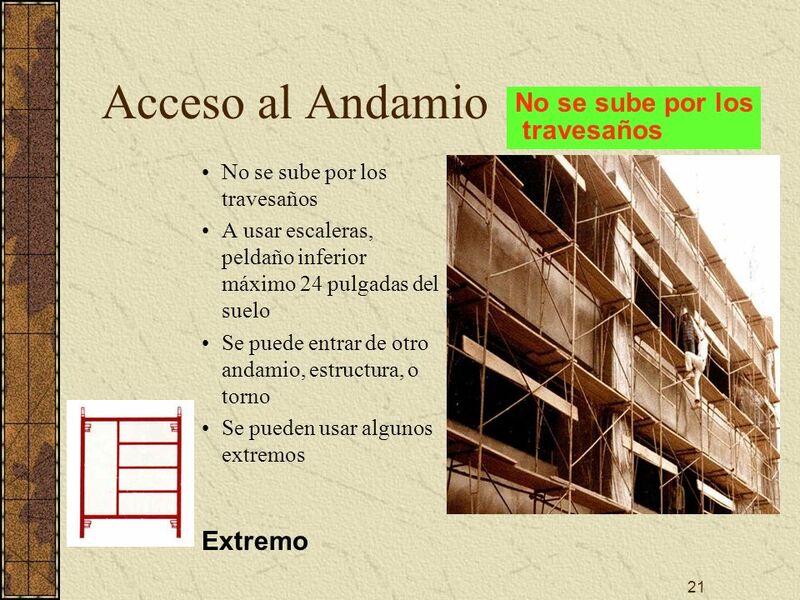 No se trabaja durante tormentas o vientos fuertes No se permite acumulación de escombros No se usan improvisados para extender altura de trabajo con excepción de escaleras que: Estén contra la estructura adyacente y el andamio esté asegurado Estén en una plataforma estable Tengan patas amarradas 11. No work may be performed on scaffolds during storms or high winds. 12. Don't allow debris to accumulate on scaffolds. 13. 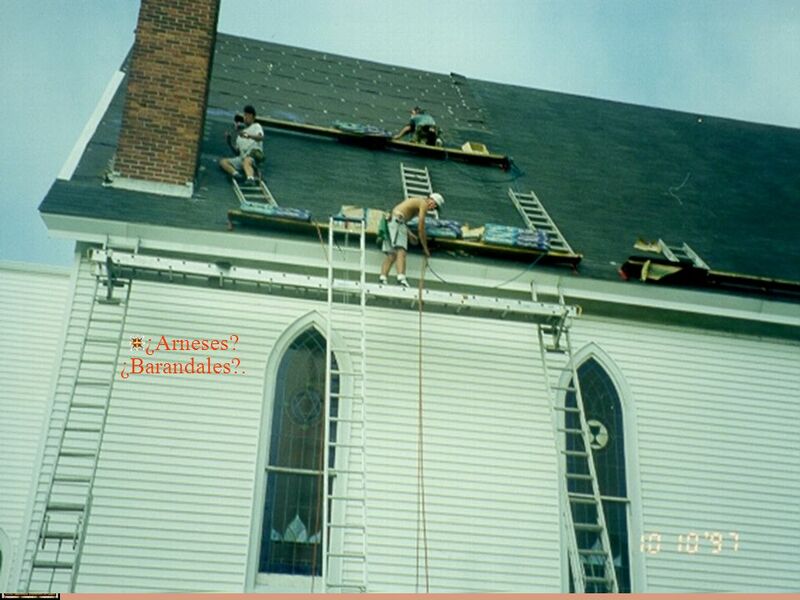 Don't use makeshift devices to increase work height on scaffolds except for ladders that: a. are against an adjoining structure and scaffold is secured; b. are placed on secured platform; or c. have ladder legs secured. 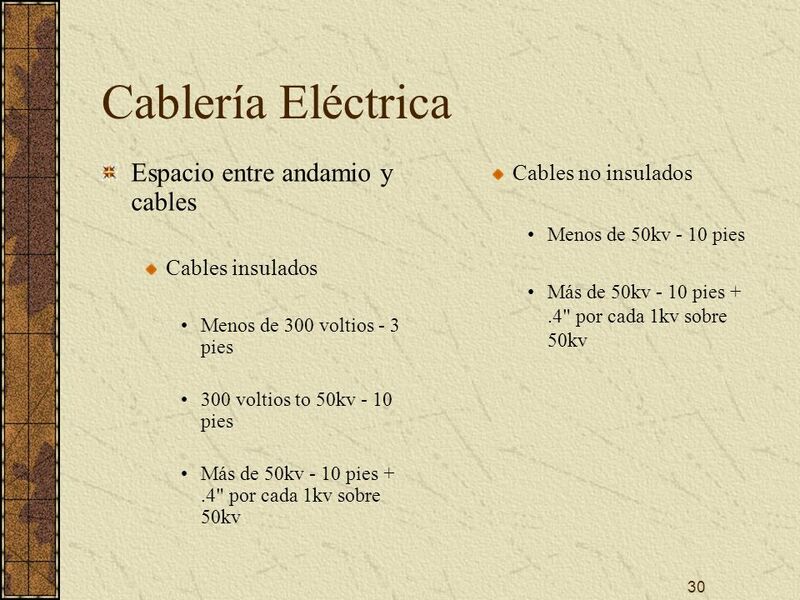 Cables insulados Menos de 300 voltios - 3 pies 300 voltios to 50kv - 10 pies Más de 50kv - 10 pies + .4" por cada 1kv sobre 50kv Cables no insulados Menos de 50kv - 10 pies Más de 50kv - 10 pies + .4" por cada 1kv sobre 50kv R Certain clearance restrictions apply when working around power lines with scaffolding : 1. Insulated lines a. less than 300 volts - 3 feet; b volts to 50kv - 10 feet; and c. greater than 50kv - 10 feet + .4" for each 1kv over 50kv. 2. Uninsulated lines a. less than 50kv - 10 feet; and b. more than 50kv - 10 feet + .4" for each 1kv over 50kv. 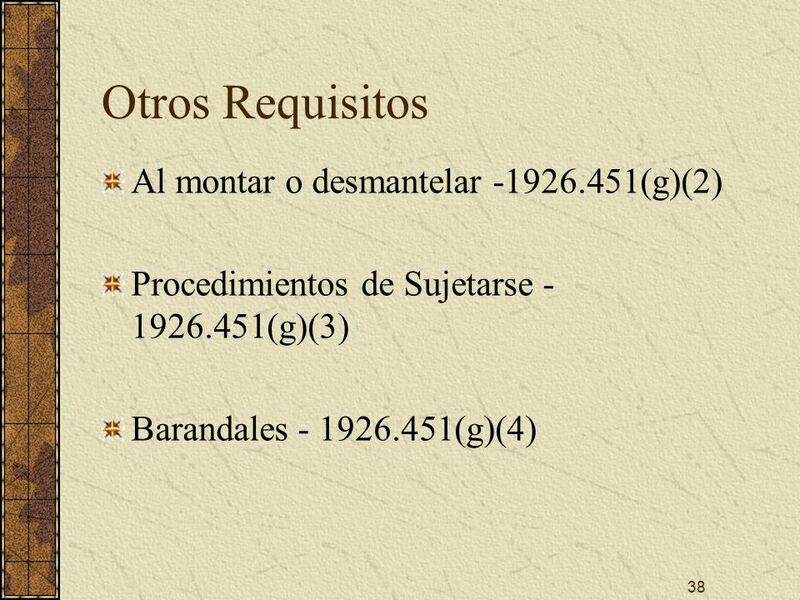 31 ¡Esto no cumple con el requisito! Más de 10' arriba del nivel inferior III. 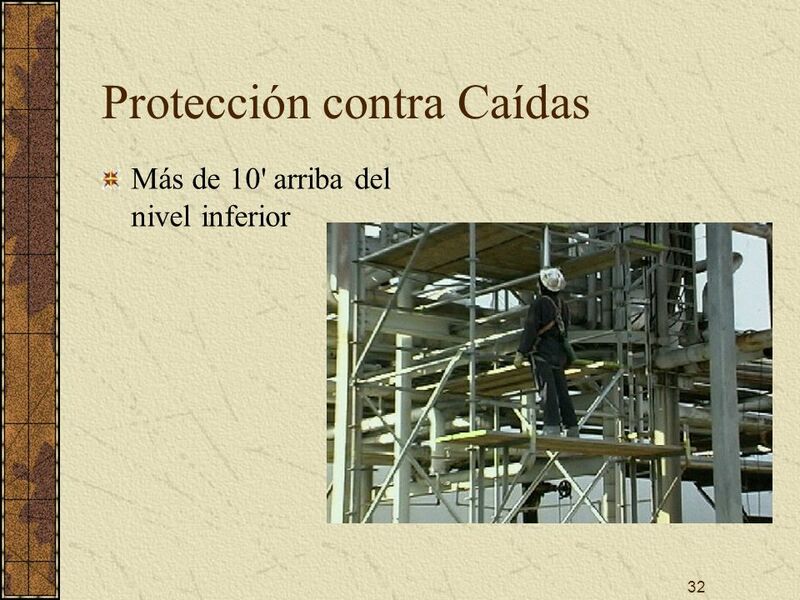 Fall Protection A. We now need to take a look at the fall protection requirements associated with scaffolds. 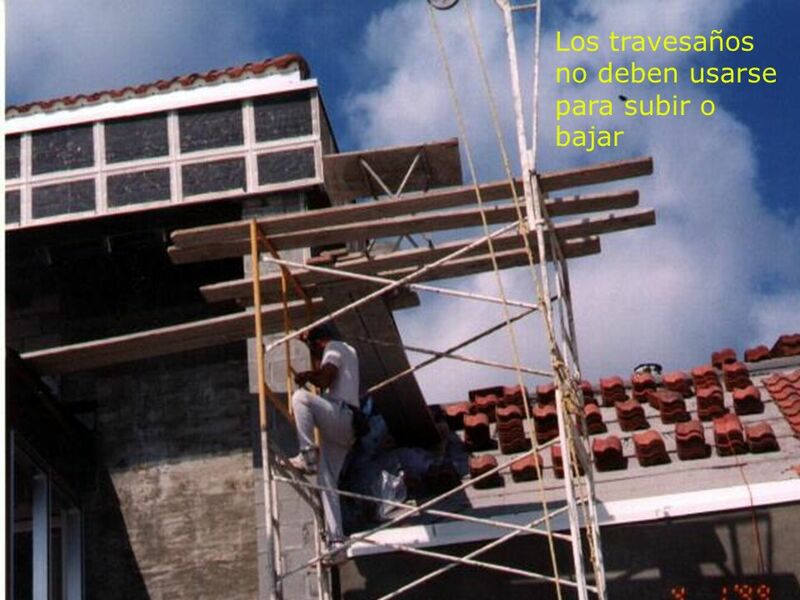 If working more than 10 feet above a lower level, then fall protection is required. 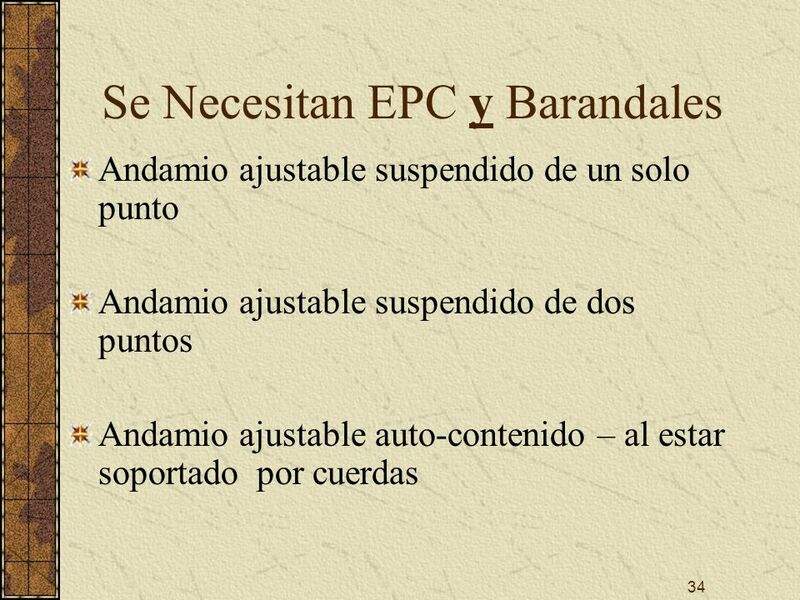 Andamio ajustable suspendido de un solo punto Andamio ajustable suspendido de dos puntos Andamio ajustable auto-contenido – al estar soportado por cuerdas C. Personal Fall Arrest equipment and a guardrail are required for the following: 1. Single point adjustable suspension scaffold. 2. Two-point adjustable suspension scaffold. 3. Self contained adjustable scaffold - when supported by ropes. 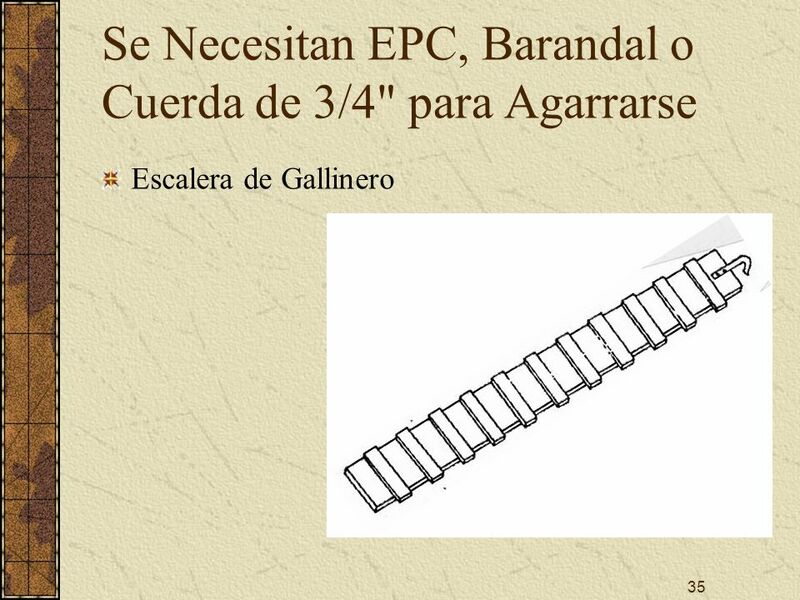 Escalera de Gallinero D. If using a crawling board (chicken ladder) then Personal Fall Arrest equipment, a guardrail or 3/4 inch grabline must be used. 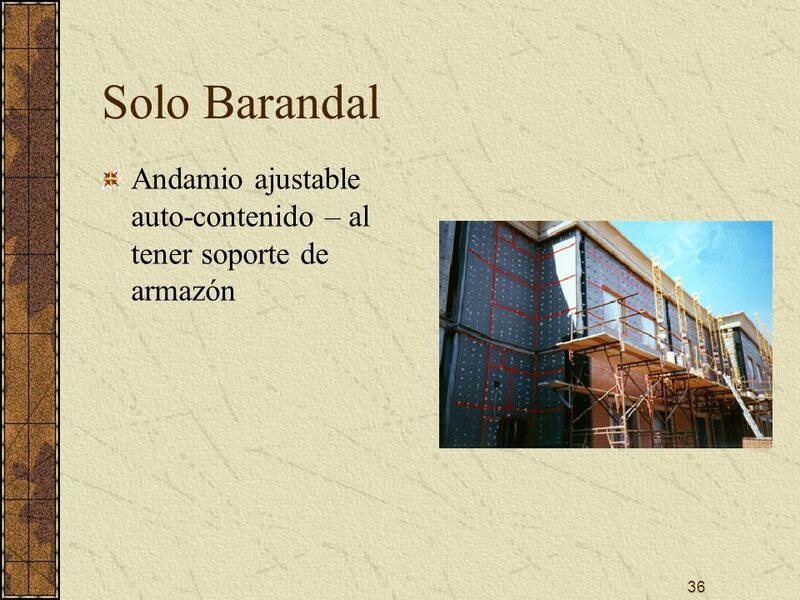 36 Solo Barandal Andamio ajustable auto-contenido – al tener soporte de armazón E. If using a self contained adjustable scaffold that is supported by a frame structure then a guardrail may be the only fall protection that is required. 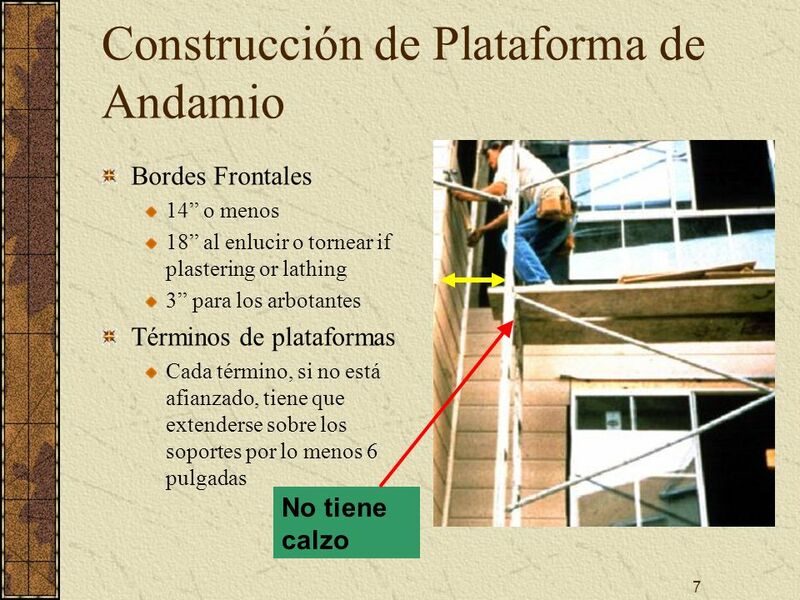 Todos los demás andamios no mencionados aquí F. Use Personal Fall Arrest equipment or a guardrail if using the following scaffolds: 1. Overhand bricklaying from supported scaffold. 2. All other scaffolds not previously mentioned. Use cascos Ponga barricada abajo Use guardapies Proteja arriba del guardapies Barandal con aberturas pequeñas Ponga cubierta sobre los trabajadores abajo IV. Falling Object Protection A. When workers are exposed to a potential hazard from falling objects, there are certain guidelines which must be followed: 1. All workers must wear hardhats on the job. 2. If workers below a scaffold are exposed to falling objects: a. barricade below and don't allow workers in the hazard area; b. use toeboards to keep objects from falling; c. if objects protrude above the toeboard, protect above toeboard with screening or paneling; d. ensure guardrail systems have small openings to prevent objects from passing through; or e. erect a canopy over the workers below if necessary. 40 ¿Dónde están los cascos? 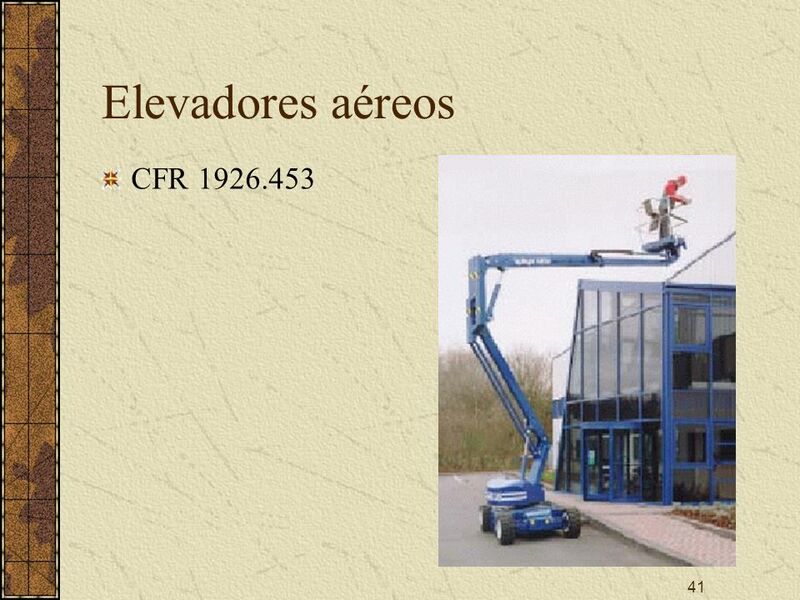 A. Aerial Lifts are widely used in construction today and there are guidelines which must be followed when using them. 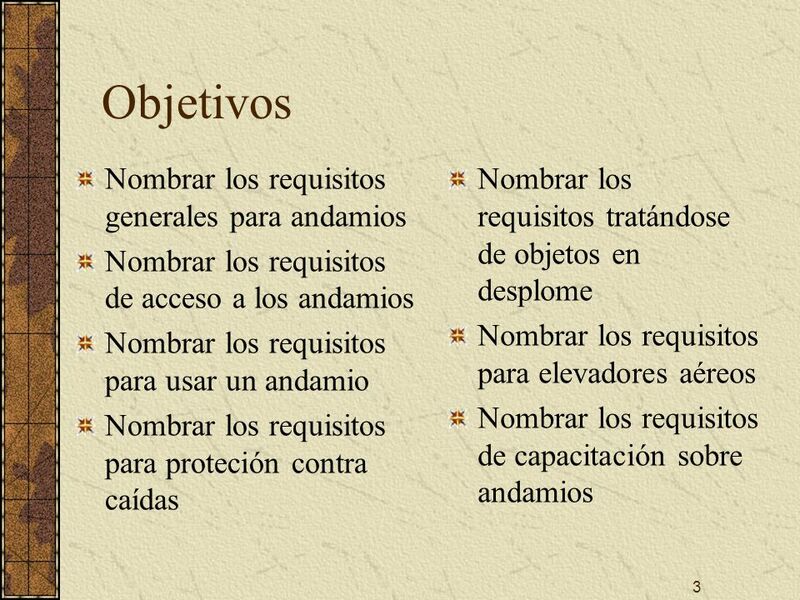 La escalera tiene que asegurarse antes de mover el vehículo D. There are specific requirements for equipment which will be covered in this section. 1. 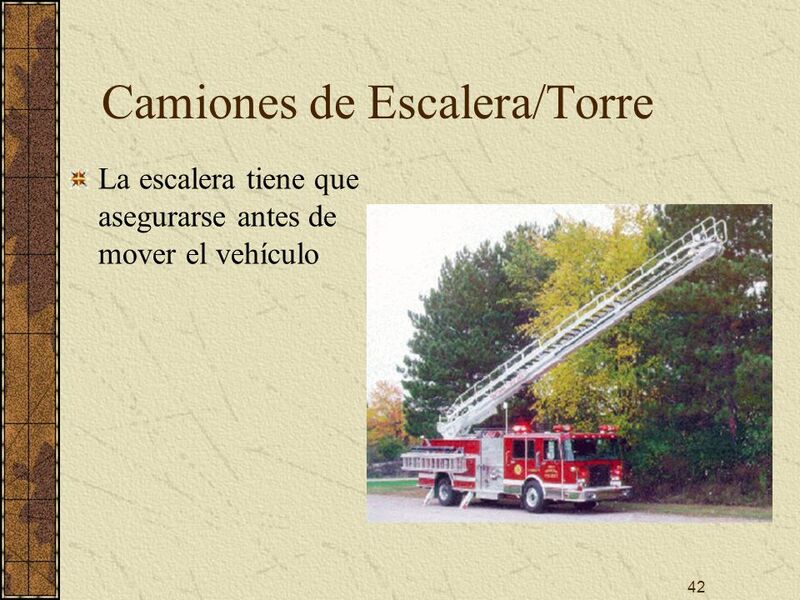 On ladder and tower trucks, the aerial ladders must be secured in the lower traveling position by the locking device on top of the truck cab and manually operated device at the base of the ladder. 2. Locking device must take place before the vehicle moves. 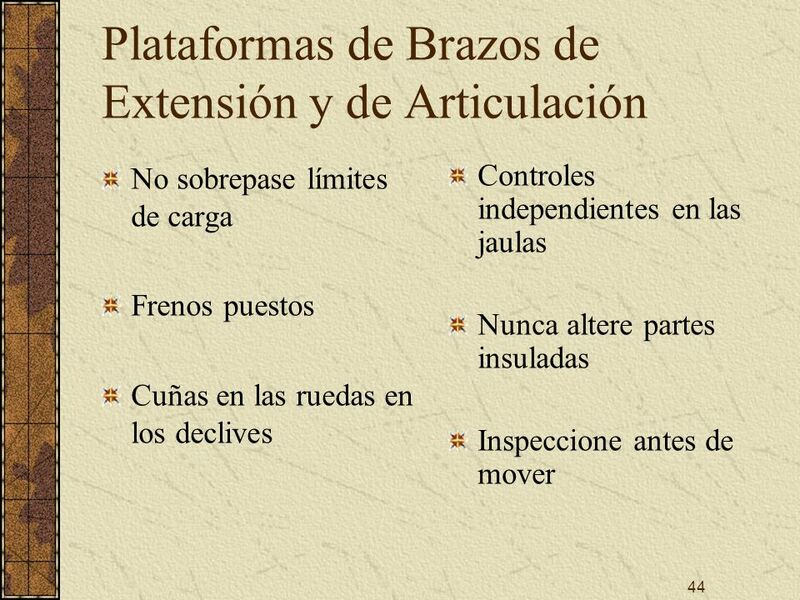 No sobrepase límites de carga Frenos puestos Cuñas en las ruedas en los declives Controles independientes en las jaulas Nunca altere partes insuladas Inspeccione antes de mover f. don’t exceed the load limits of the boom and basket; g. brakes must be set and wheel chocks in place while working; h. if the unit is designed primarily for carrying personnel, then upper as well as lower controls must be provided; never alter insulated portions of a lift; and j. before moving a lift, inspect to see that it is properly cradled and the outriggers are in a stored position. 45 ¿Buenas Prácticas de Trabajo? 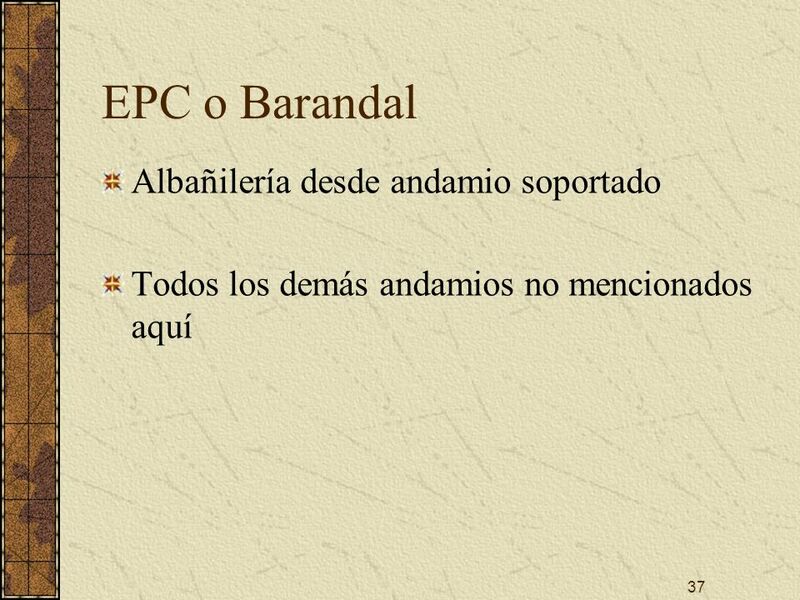 Persona trabajando en el andamio Tipos de peligros: eléctricos, caídas, y objetos en desplome Tratando los problemas eléctricos Protección contra caídas y objetos en desplome Uso y manejo correcto de andamios y materiales Cualquier otro requisito pertinente de esta subsección VI. Training Requirements A. 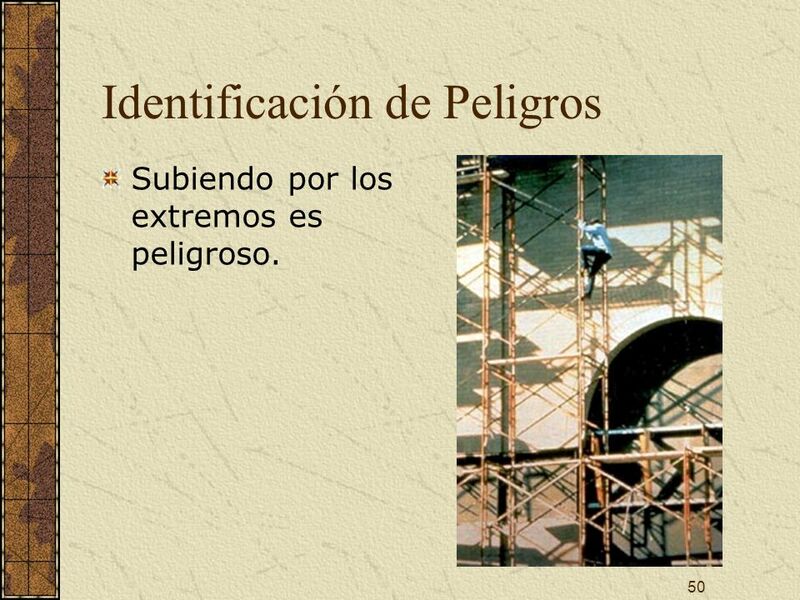 If a person is involved in the use of a scaffold, they must be trained in the following: 1. The nature of electrical, fall, and falling object hazards; 2. Procedures for dealing with electrical hazards 3. 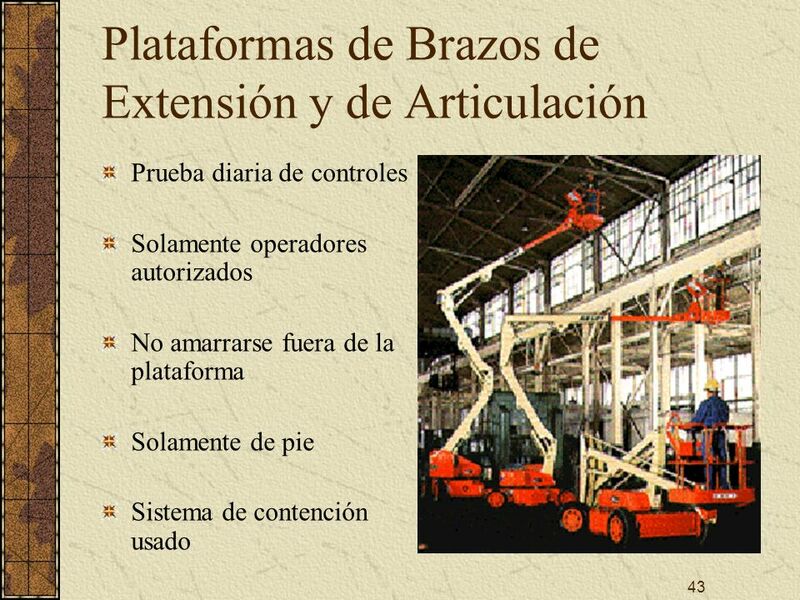 Procedures for erecting, maintaining and disassembling fall protection & falling object systems; 4. 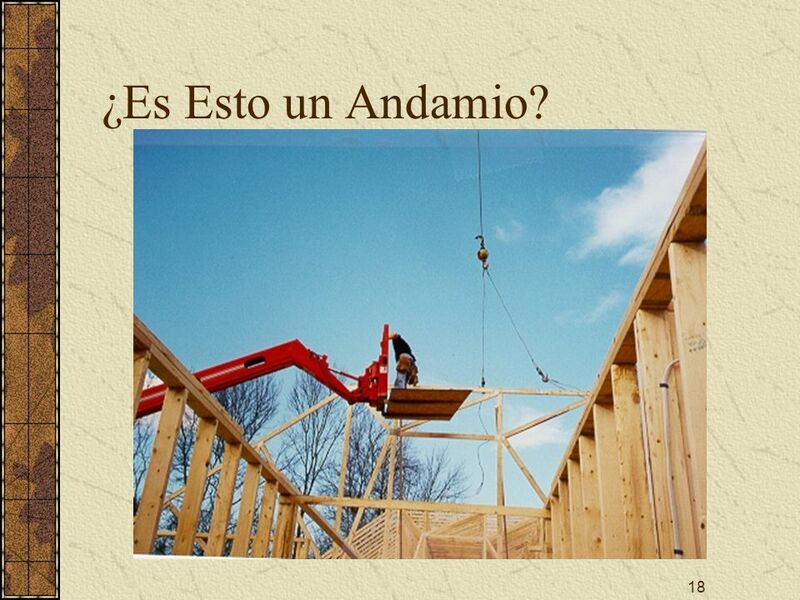 Proper use of the scaffold & handling of materials on the scaffold; and 5. Maximum intended load and load-carrying capacities of scaffolds used and any other pertinent requirements of this subpart. 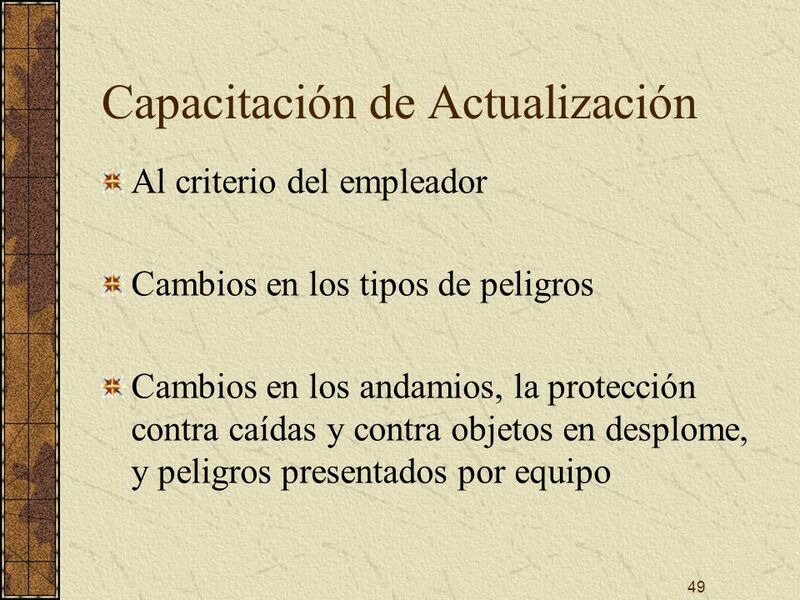 Por una persona competente: Tipos de peligros Específicos del andamio siendo usado Criterio de diseño, capacidad de carga, y uso anticipado del andamio Cualquier otro requisito pertinente de esta subsección B. Workers involved in the erecting, operating, and inspecting of scaffolds must be trained by a competent person in the following: 1. 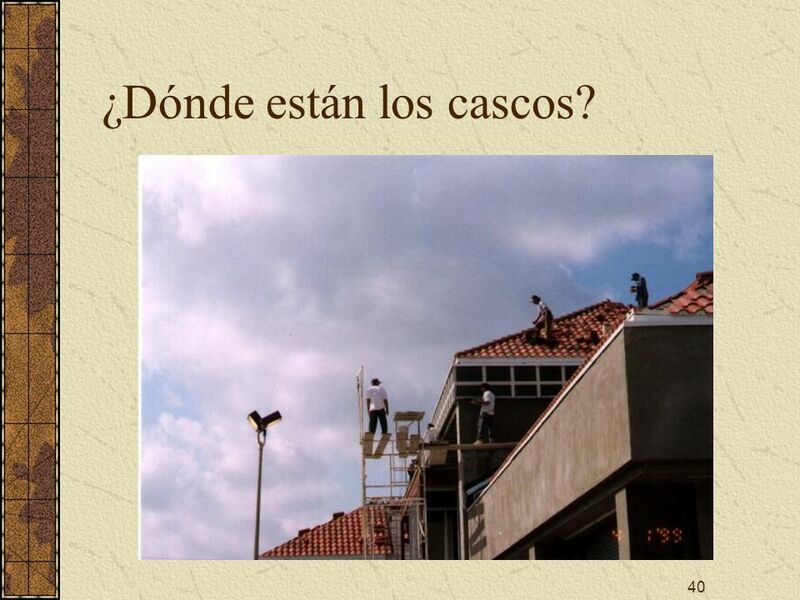 The nature of scaffold hazards; 2. The correct procedures for erecting, disassembling, moving, operating, repairing, inspecting, and maintaining the type of scaffold being used; 3. 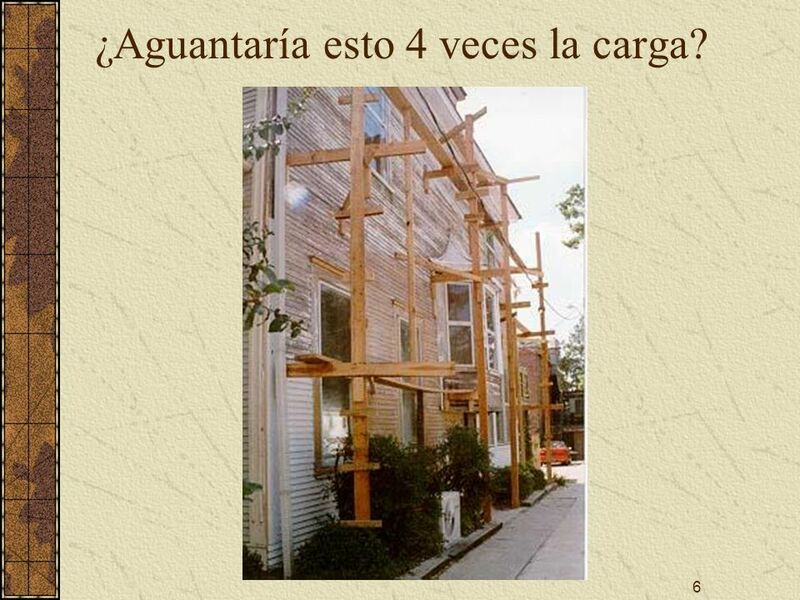 Design criteria, load capacity and intended use of the scaffold; and 4. Any other pertinent requirements of this subpart. 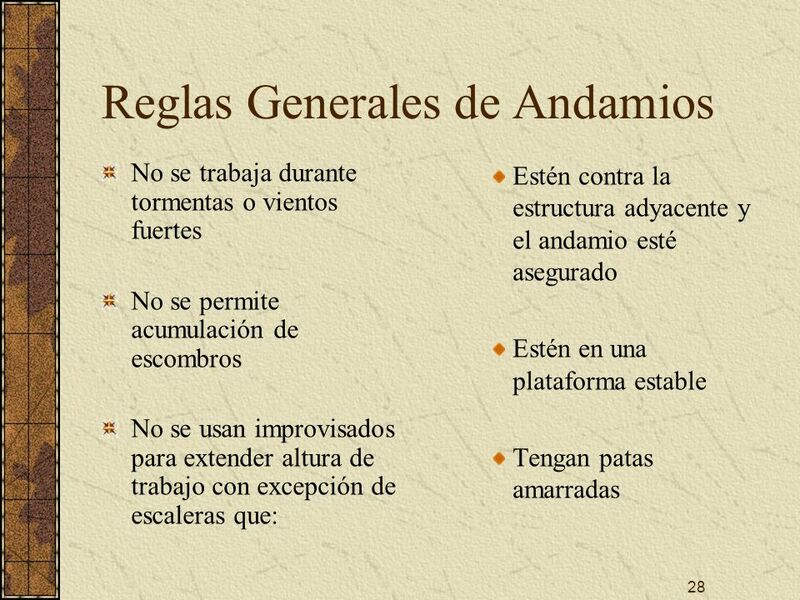 Al criterio del empleador Cambios en los tipos de peligros Cambios en los andamios, la protección contra caídas y contra objetos en desplome, y peligros presentados por equipo C. Retraining must take place under the following conditions: 1. If the employer has reason to believe that a worker lacks the skill or understanding to perform the job; 2. 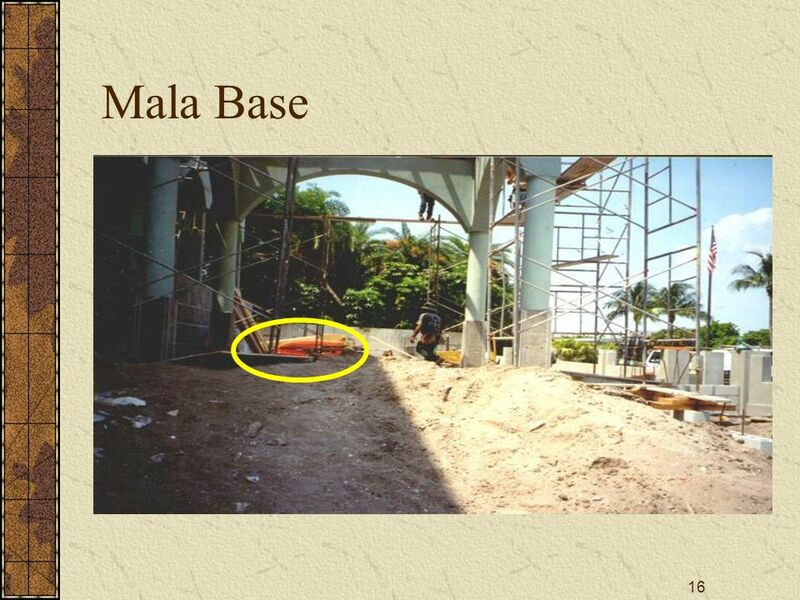 Changes in the worksite present a hazard about which the employee has not been previously trained; or 3. 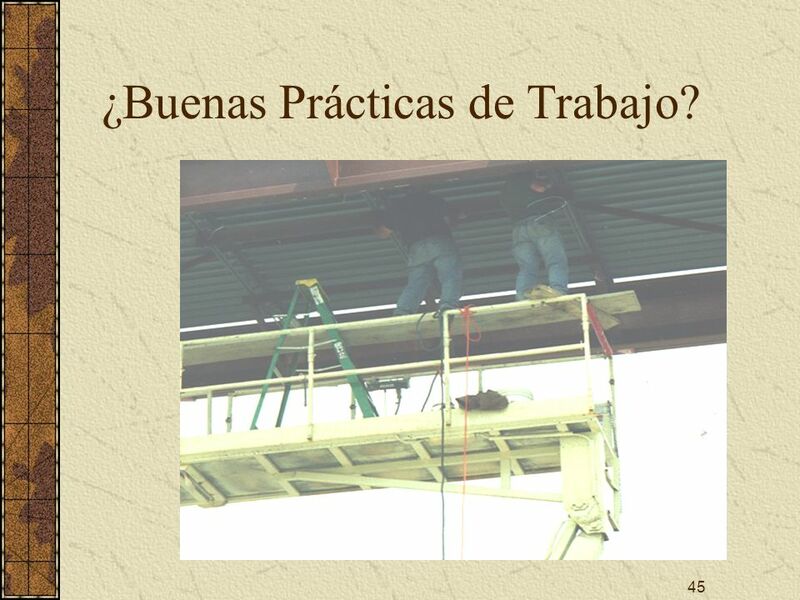 Changes in scaffolds, fall protection, falling object protection or other equipment present new hazards for which the employee has not been previously trained. Subiendo por los extremos es peligroso. Climbing end frames is not safe access. 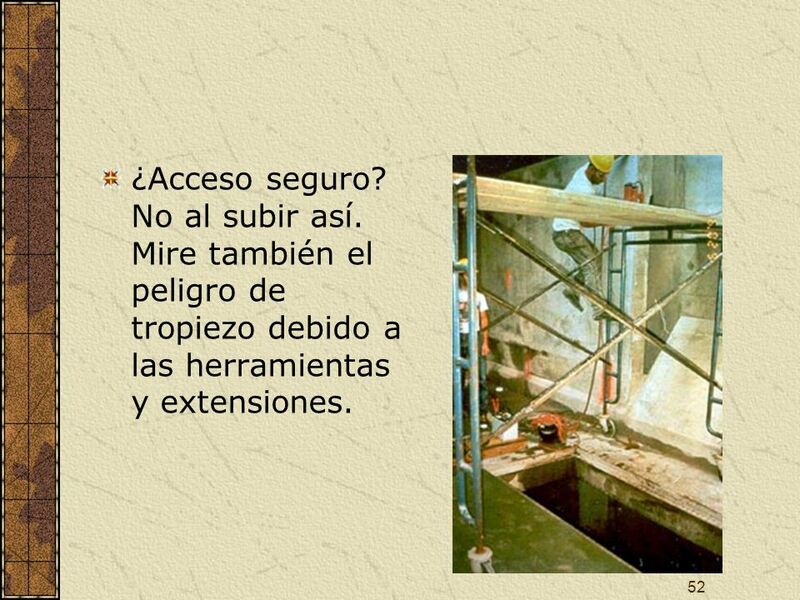 ¿Acceso seguro? No al subir así. Mire también el peligro de tropiezo debido a las herramientas y extensiones. Not by climbing this type of end frame. Note the trip hazards caused by tools and power cords. This scaffold is inside a clarifier tank at a water treatment plant under construction, and is erected over an approximately 4-foot x 10-foot floor opening, which adds another 10 feet to the fall height (6 feet + 10 feet = 16 feet). 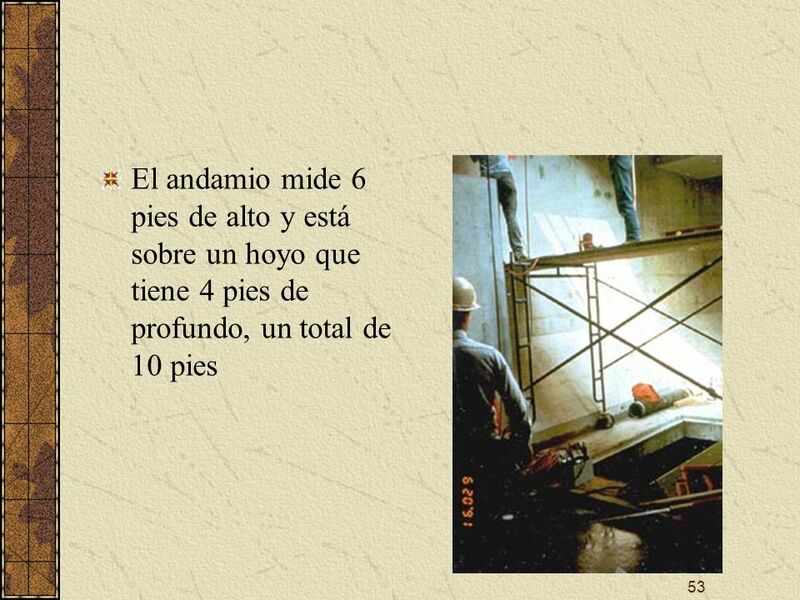 53 El andamio mide 6 pies de alto y está sobre un hoyo que tiene 4 pies de profundo, un total de 10 pies This is the same scaffold as shown in slide No. 3. The scaffold is approximately 6-feet high and is erected over an access pit (4' x 10'). There is a 10 foot fall hazard caused by the unguarded pit and therefore the total fall hazard is >/= 16 feet to the lower level (e.g. ; the bottom of the pit). Fall protection is required for this 6-foot tall mobile scaffold, because the total fall distance is greater than 10 feet. 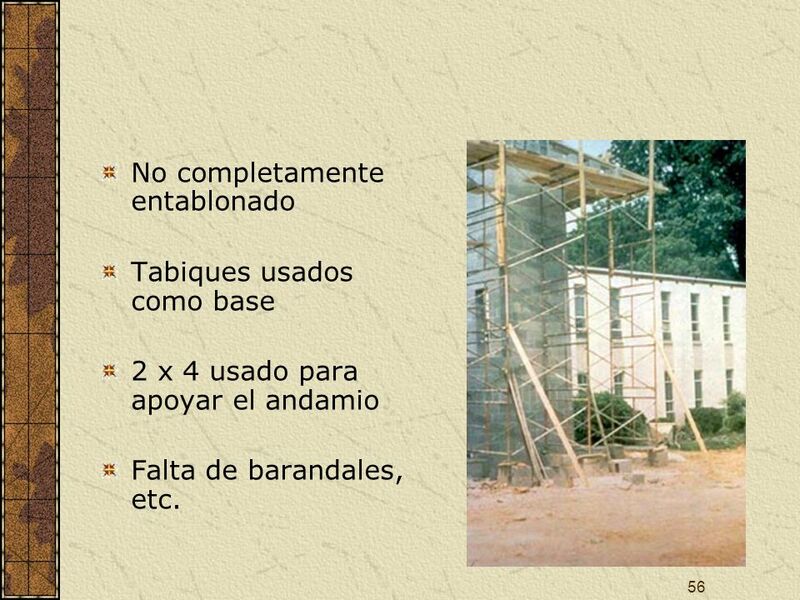 Tabiques usados como base 2 x 4 usado para apoyar el andamio Falta de barandales, etc. Unstable scaffold: Not fully planked, concrete blocks used as footing, 2 x 4 lumber used to "prop" the scaffold against the building, with #9 wire to hold the 2 x 4s in place, inadequate guardrails, etc. 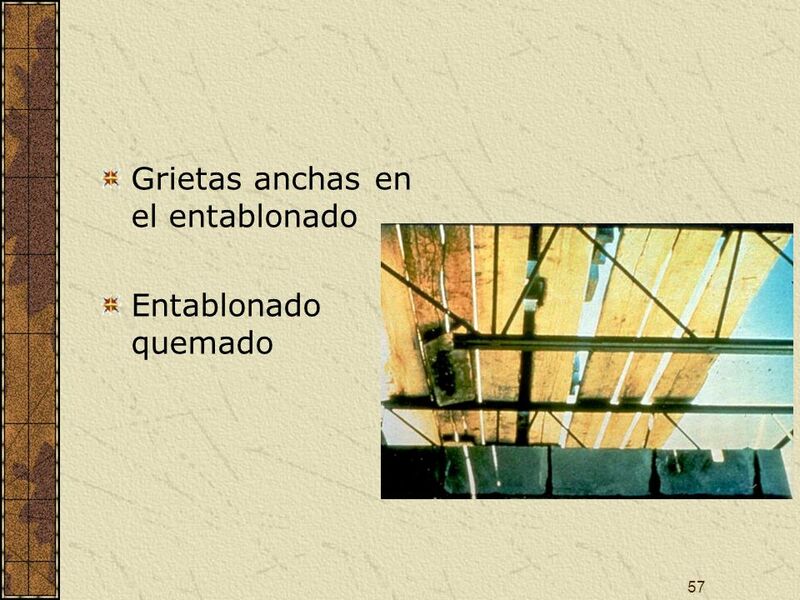 Entablonado quemado Bad planking: Lots of daylight is visible through the splits, cracks and gaps; also, planking has been scorched. 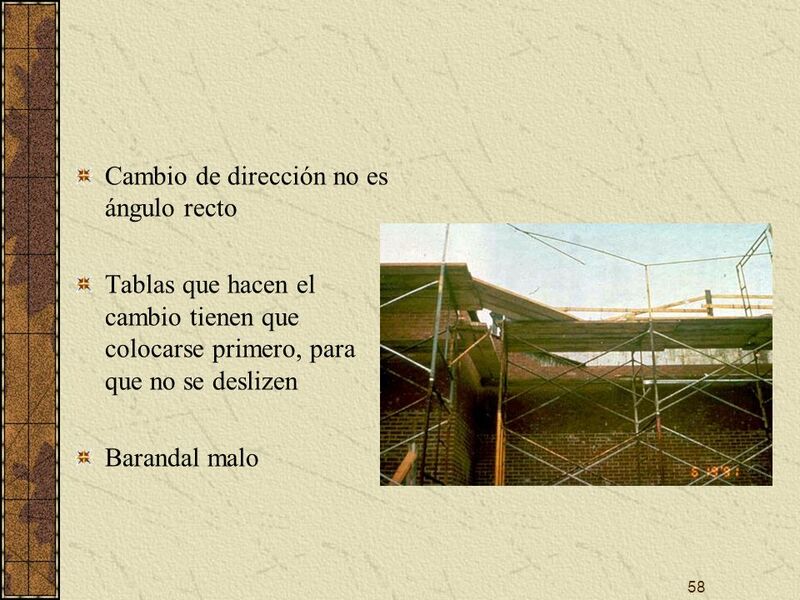 Tablas que hacen el cambio tienen que colocarse primero, para que no se deslizen Barandal malo This directional change is not at a right angle. The planks that form the change need to be laid first, to help prevent plank displacement. This scaffold also has unsafe guardrails, in that there are no midrails or toeboards, and the toprail is held together with #9 wire. Also, the toprail has a gap between the rail and the platform. 59 Espacio más de 14 pulgadas entre el edificio y la plataforma. 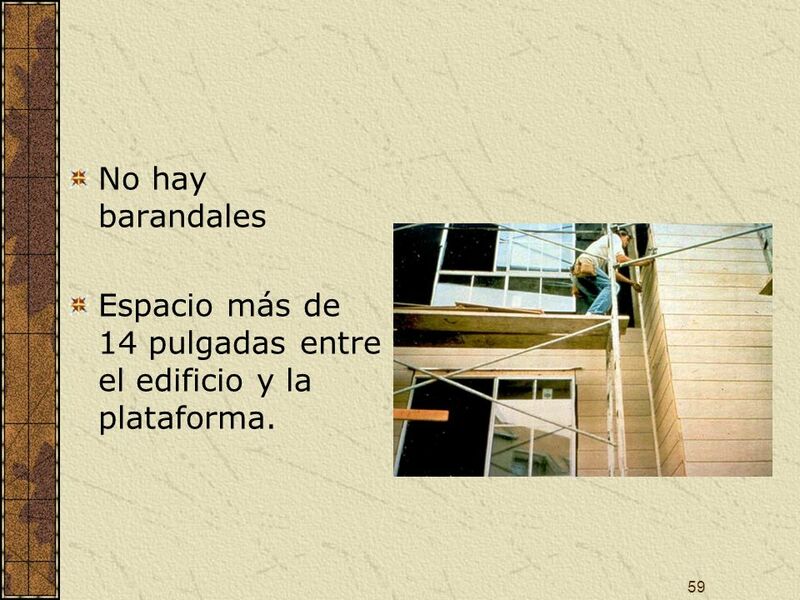 No hay barandales Espacio más de 14 pulgadas entre el edificio y la plataforma. The planks are not cleated or otherwise secured against displacement, there are no guardrails, and there is greater than a 14-inch gap between the building and the scaffold platform. 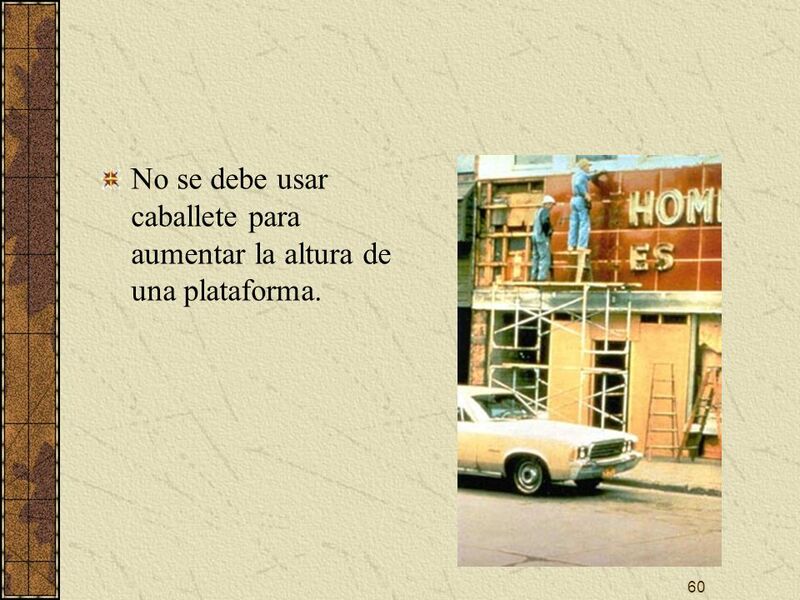 60 No se debe usar caballete para aumentar la altura de una plataforma. This scaffold is on a city sidewalk, and a saw horse is being used to increase the working height of the scaffold. This indicates that the scaffold is too short for the job. OSHA prohibits using "makeshift" objects (e.g., saw horses, buckets, milk crates, etc.) 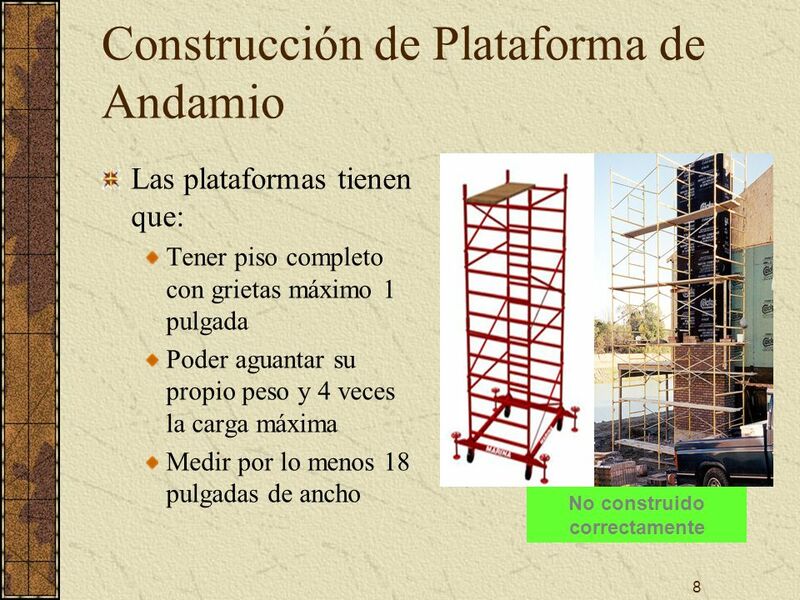 to increase the working height of a scaffold, because an unstable platform increases the likelihood of a fall. 61 ¡No llegue usted a ser una estadística! 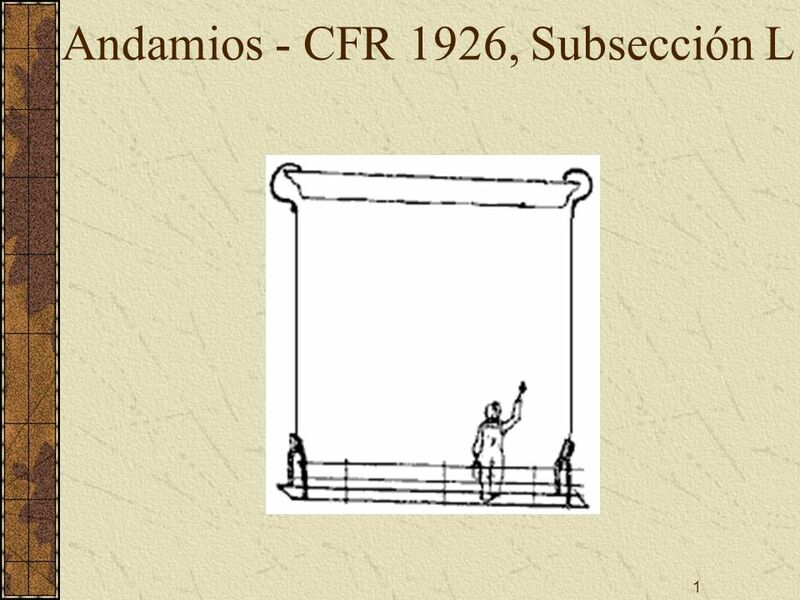 Descargar ppt "Andamios - CFR 1926, Subsección L"